Tax Increment Financing (TIF) is a method for financing public infrastructure (usually roads) by using a portion of new property tax revenues for a specific development for a fixed period of time. In a period of time where public financing for road improvements is scarce, TIF financing can help bring about some road improvements that might otherwise be delayed or not funded at all. Using TIFs in connection with a new development can be a great benefit to the entire county when used to fund infrastructure that will provide benefits that will extend beyond the limits of the new development. 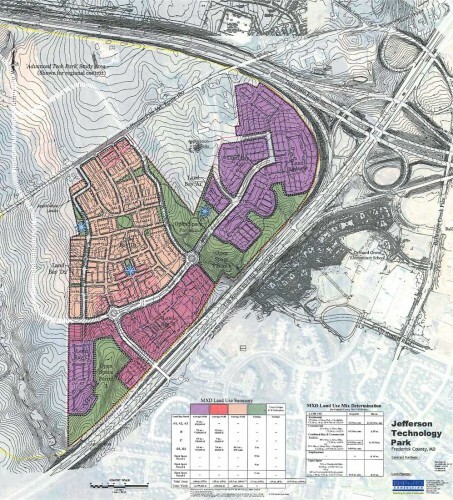 Opponents of the Young Board have criticized us for utilizing Tax Increment Financing (TIF) to build certain infrastructure in connection with Jefferson Tech Park and the Oakdale-Lake Linganore developments. Our opponents argue that this is nothing more than requiring the county taxpayers to pay for this infrastructure—that this gives a big financial benefit to the developers on the backs of other county taxpayers. This criticism is not well founded. It does help developers in the sense that it allows a development to occur, but the TIF itself is not a direct benefit to them. And as for other taxpayers, it is of no direct consequence to them; it does not diminish the tax revenues at all. Rather it merely uses new, increment taxes to fund new infrastructure. If done right, all new tax revenues (including from new income tax revenues) can be a net benefit to all county taxpayers. In fact, in the case of both Jefferson Tech Park and Oakdale-Lake Linganore, the TIF will enable the building of infrastructure that will be a tremendous benefit to the entire county, and at a reasonable cost. The use of TIFs in connection with both of these projects was the right thing to do. Definition of a TIF. First of all, to understand whether the use of a TIF is good or bad, one must first understand what a TIF is. Here is an example that will illustrate it. Farmer Brown owns 100 acres that had been zoned Agriculture. The property has been rezoned for Mixed Use Development. The property tax revenues from this land as “Agriculture” was $5,000 per year. The property tax revenues from this land as “Mixed Use” will be $25,000 per year. The difference in the two revenues is the “increment” referred to in Tax Increment Financing. Thus, in this hypothetical, the “tax increment” would be $20,000. A TIF works like this: If a TIF is approved, then Farmer Brown will continue to pay property taxes at the Agriculture rate on his property for a certain period of years. The increment tax revenues (under the higher tax rate use) will be used to make the payments on a bond, which the County will have obtained to build certain infrastructure related to the project. The TIF payments will be made by the owners of the land subject to the TIF. The TIF agreement provides that the County has no liability for the TIF payments. The TIF agreement will provide that the bond be repaid over a certain number of years. Any excess payments received from the TIF payments will go to the County’s General Fund. A TIF makes sense when the project to be funded will benefit a large part of the county, by building something that would not otherwise be built. Jefferson Tech Park TIF. As applied to the 173-acre, Jefferson Tech Park, this pertains to a development planned for a mixed-use development between Route 340 on the south and Route 180 on the north, near the intersection with Butterfly Lane. Approximately two-thirds of the proposed development would be commercial, and approximately one-third residential. In 2012 the BOCC approved a $33.3 million TIF that would be use to help build the interchange/ bridge on Route 340, two roads in the development (Jefferson Park Blvd and Jefferson Plaza Way), and some sewer improvements. The justification for this TIF is that it will help this particular development to bring some commercial development (including a major hotel) and thousands of jobs to an area that is right next to a major commercial part of the City of Frederick. This is an area which would be ideal for commercial growth, and this would be one of the most ideal locations for new jobs in the county. The TIF will facilitate this development. Oakdale-Lake Linganore (Meadow Road) TIF. As applied to the Oakdale Village development (involving 1,560 acres of land west of New Market), in 2014 the BOCC approved a $25 million TIF to construct the Meadow Road interchange on I-70. This is the largest project that was restored for development when this BOCC revised the Comprehensive Plan in September of 2012. This one project accounts for approximately 1/3 of all land being restored for development, and this project will basically provide for completion of the Lake Linganore PUD that was first started in the 1960s. The TIF for this project will be used to build a new, west-bound ramp from Meadow Road to I-70, and to improve the east-bound ramp onto I-70. This improvement will remedy the increased traffic congestion that will be caused by the development. There is no prospect of receiving State funding for this interchange improvement at this time. Without TIF funding, the road improvement would not be made. When the first phase is completed, this improvement will alleviate traffic congestion in both Frederick and New Market. On July 14, 2014, we learned that the NEPA work that will be required for the Meadow Road interchanges will only cost 1/3 of what was originally projected. Consequently, it is currently projected that the cost of the TIF will be approximately $11 – $12 million—one half of the original estimate. (That projected cost is further broken down as $3 M for the westbound improvement, and $8M for the eastbound improvement). Thus, while the BOCC approved a TIF up to the amount of $25 million, it now appears that the TIF will only need to be for half of this amount. BOCC opponents argue that it would be a burden on all county taxpayers to pay for these improvements funded by the TIFs, and that the county as a whole would not benefit from these improvements. I disagree. In each case the improvements secured by the TIFs provide benefits to a large part of the county—to many more people than just to the residents of the TIF areas. New residents who will come into the TIF areas will be paying impact fees, school mediation fees, and perhaps other development fees. These developments will not be finished in a short period of time, but rather they will take place over many years. Thus, bonds will be issued up front to pay for the improvements. The repayment of these bonds will occur gradually, as the development is occurring, over a period of 30 years. Further, the benefits from the improvements constructed by the TIFs will be available at the beginning of the developments, before (and some times many years before) the development is completed. The combination of these factors results in development where infrastructure improvements keep pace with the new development, and where the cost burden is primarily born by the people moving into the TIF areas. Opponents of these two TIFs also argue that the cost of the TIFs is much higher than what I have stated. They argue that the cost of the Jefferson Tech Park TIF is $89 million and that the cost of the Oakdale TIF is $77 million. Their selection of these figures apparently comes from their referencing the cost of the capital improvements plus the amount of interest projected to be paid over the term of the TIF. These cost figures are misleading for two reasons. First, using these figures to value the cost of the improvements is like using the total value of all loan payments on a 30-year mortgage loan as the value of the home being purchased. I understand the importance of understanding this figure, but it is not really the value of the house. Similarly, these financing costs are not really the value of the improvements. Second, the benefit value of both of these approved TIFs are greater than the anticipated cost of the improvements. With respect to the cost of Jefferson Tech Park, because that project includes many new jobs, it is expected that the income tax revenues generated will more than make up for the increment of property taxes that will be deferred during the term of the TIF. Also, to the extent that more tax revenues are generated from the TIF than are needed to repay the TIF, then those funds will go into the County’s General Fund. And third, our opponents’ projection that the total cost for the Meadow Road TIF will be $77 million is more than two times more than the actual cost. Since the cost of the Meadow Road improvements will be less than $12 million, the total cost (including financing) will be only approximately $36 million. For all the reasons explained above, as applied to Jefferson Tech Park and to the Oakdale-Lake Linganore development, the BOCC’s use of TIFs will be a great benefit to the County by bringing needed road improvements, jobs and income tax revenues that would not otherwise be available.